I was really excited to get this fan here. My grandparents had a ranch near Austin and I can remember my grandfather had a ge pancake on his desk for as long as I can remember. From basic memory I believe it was an '04 so I am really excited to get this one. Sadly I do not know what became of his fan after he died. Bought this one from a forum member. Was told Eddie Frank gave it the once over (not restored just checked it out) at some point in the past 5 years, but Eddie thinks it was his dad that looked it over not him. I have no clue on that and it didn't effect me buying it one way or the other. It's a dirty fan as you will see. I got it put together and wired it up and it runs great on the 1st two positions on the switch. Which is a little loose feeling. Flipped it over and it appears to need the speed coil wires reattached? The cage is correct to my eye and appears to be in good shape. Not sure if the GE cap is supposed to be soldered or not? the blade is tarnished but runs good and seems to be balanced with a good hub. Oh yeah its a 12 inch pancake. Paint is beginning to wear through but still in good condition. Have not been able to get the brass collar off. I removed the screw on the shaft but am trying not to damage the collar. If I decide to clean up the rotor and motor and such, would hitting it with air from an aircrompressor be ok or might that be too risky with the strator? I am excited to have it though. It runs good in the first two positions on the switch. t's nice when all the parts are there. Are you going to paint it? Congrats on the new fan! The 1904 half-ribbed based pancakes are my favorite pancakes. Thanks. Yeah I will probably get it painted. I had already talked to eddie about possibly sending it his way. I have a nice original BMY, would like this one to be really nice. Any advice on how to go about cleaning out the motor area or getting the collar off? Try some spray penetrant to get the oil drain off. You are speaking of this part, yes? Penetrant, maybe some heat, and work it carefully. Yes thats it. Will try that. It should just pull off correct? Also, since it runs on the first 2 settings on the switch, would it be a good idea to try resoldering the wires onto the switch to try and fix it? The oil return collar looks like it has been partially pulled off but at an angle. I'd try to gently tap it back on evenly then gently get behind it and tap off. The part is a press fit. I recommend a soft bristled paint brush to clean the stator and rotor as opposed to compressed air. 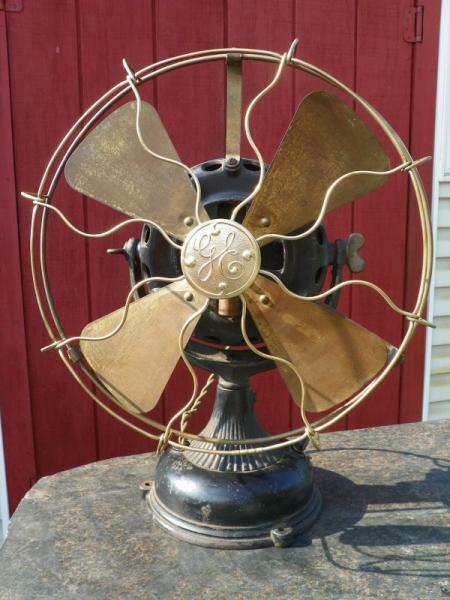 I will Third that motion of cleaning the motor with a soft bristle brush--Paint on this fan looks very good - I would not repaint it - I WOULD CLEAN AND WAX IT. Should I just try resoldering the switch? I wouldn't paint this fan in my opinion. The original paint is almost all there and would shine up better than most new paints, not to mention would be more durable! Cakes are also more valuable than BMY's when kept original. Would save you lots of time and money as well!!! Great fan. I completely agree with the above. 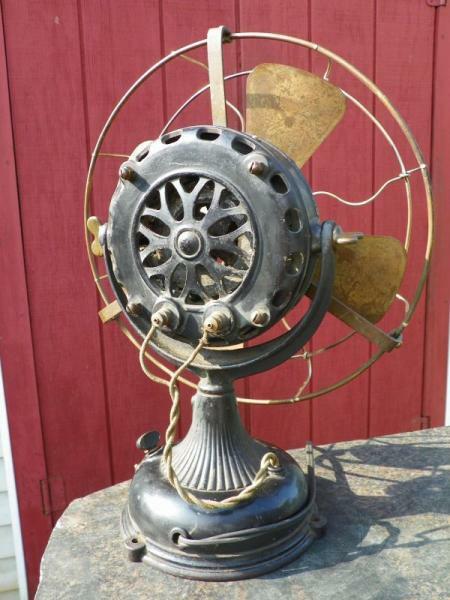 You've got a 115 year old fan that has survived in good shape. I'm not sure what repainting would buy you other than a fan that now looks exactly like all the others. They all age differently and when they look as good as yours after over a century of use, I think that they should be cleaned, repaired and nothing more. Your pancake is a great fan. I agree with "don't repaint" but I would not "shine" the original paint either which would only accentuate the chips and flaws. Clean the pan well but don't try to make it shine like a concours car and you'll have a real antique that will hold its value. The choke is easily resoldered. There is one wire coming out of the choke coil to the high connection. The next three positions have two wires each coming out of the choke and low will have one wire attached from the choke. Readings will be 1.9 ohms between high and medium high, 1.0 ohm between med low and medium, .9 ohm between med and med low, and .5 between med low and low. Readings are approximate but will be close. Got a chance to take the coil off and look at it. Do the wires look good? I know they aren't twisted together like thecones in Kim's pic. The choke that I posted the picture of is repaired. The taps were too short to do anything with, so I soldered new taps on using 24 ga magnet wire and then rewrapped the entire coil with friction tape. Clean the ends off on your taps and add some length to them and you should be good. Got the collar off and the bearing out. Bearing looks practically new compared to the rest of this fan. 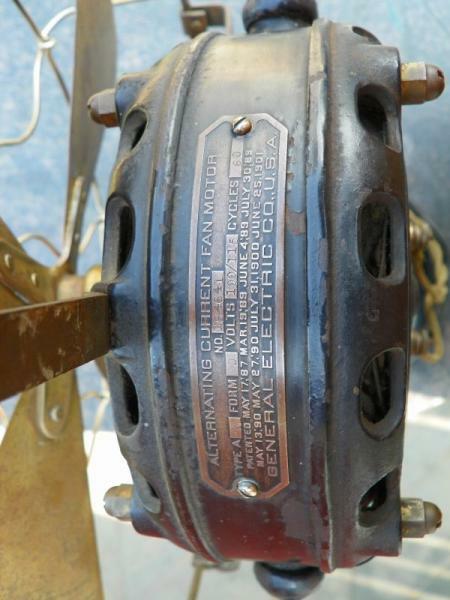 The rotor appears to be painted black? I had thought it was just grease and dirt, but it appears to be paint. Were they originally painted black or gold like on some of the restorations? Rotors were painted a dull black. But the rotors are made of cast brass so they can be made to look different than the factory chose to do. Bill Holcombe wrote: Got a chance to take the coil off and look at it. Page processed in 0.2106 seconds (21% database + 79% PHP). 29 queries executed.